Fines or fine particles are small particles that are present in porous media. 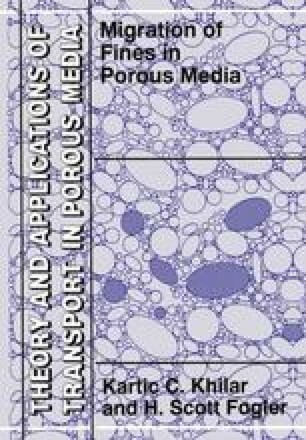 The migration of fine particles in porous media is a challenging problem of both scientific and industrial importance. By migration of fine particles, here, we mean the entire sequence of occurrences of release or detachment of fine particles present in the porous media, their motion with the flow, and finally their capture at some pore sites or their migration out of the porous medium. Many applications can be found in fields such as of Petroleum, Geotechnical, Chemical, Environmental and Hydraulic engineering. The practical consequences of the migration of fines can be either beneficial or adverse in nature and will be discussed briefly in this chapter.